Cranberry hibiscus (Hibiscus acetosella, also called false roselle) is one of the most striking and colorful plants in the “edible landscape” section at ECHO (see Figure 2). The red leaves remind those of us who come from temperate climates of the red maple tree. If the plant is not pruned it tends to grow so tall, perhaps 3 meters, that its modest sized stem is unable to support it. It eventually bends way over. On the other hand, when it is young it responds very quickly to pruning by using your fingers to pinch off growing tips. In this way it can very easily be made into a densely branching bush. Cranberry hibiscus is an annual or short-lived perennial. It grows so quickly that it is sometimes grown from seed as a frost-tender annual even in cool-temperate regions. Cranberry hibiscus makes a colorful temporary hedge, which can be pruned and harvested at the same time! The attractive flowers are only produced during short days. At ECHO they begin blooming late in September. We have seldom had any disease or insect problems with it, though if our winters are unusually cool it goes dormant and looks a little “ragged” for a few months. It grows so fast that it is easy to replant from seed, but can usually be kept for a second year if desired. 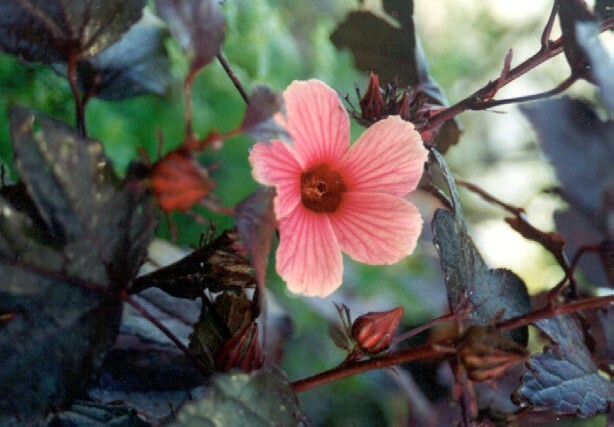 Figure 2: Hibiscus acetosella, also called cranberry hibiscus or false roselle. Photo by Martin Price. At ECHO, Cranberry hibiscus leaves are regularly eaten in salads and cooked in stir fries of mixed vegetables. The red leaves remain reddish even after cooking, making for an attractive addition to any dish. The leaves are pleasantly sour and slightly mucilaginous (i.e. slimy), and are most often added in small quantities to foods. Cooking the leaves with peanuts may help reduce the sourness. In Central America, flowers are blended with ice, sugar, lemon juice and water to make a purple lemonade. Contrary to roselle (Hibiscus sabdariffa), a sister species whose calyx (a collective term for the sepals of the flower) makes a popular drink in the tropics, the calyx of cranberry hibiscus is not fleshy and is not eaten. The stem is not edible, although it yields a small amount of good quality fiber. Cranberry hibiscus is available from ECHO’s seedbank.